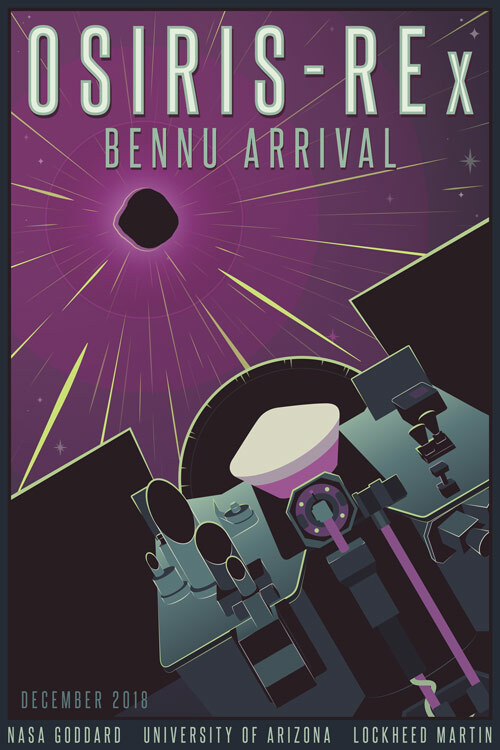 After traveling through interplanetary space for over two years, NASA's OSIRIS-REx asteroid sample return mission has arrived at asteroid 101955 Bennu. The robotic probe will fly in formation with the asteroid, surveying its surface, looking for gas plumes and any small natural satellites. After the asteroid has been thoroughly surveyed, a sample location will be selected, and a sample will be taken from the asteroid's surface. The sample will be returned to Earth in September of 2023. On Dec. 3 at 11:45 am ET, members of the mission team will be on a LIVE NASA broadcast from the control room at Lockheed Martin discussing the spacecraft’s arrival at Bennu. You can view the broadcast on Facebook Live, Ustream, YouTube and the NASA website. OSIRIS-REx near Bennu Dec. 3, 2018. Credit: NASA Eyes on the Solar System / Bob Trembley. OSIRIS-REx Collectibles: posters, paper model, technical papers, infographics, etc.